This sweet little picture is from the Little Gallery line and measures approximately 4 1/2" x 3 1/2" The foil sticker on the back states the frame is made from genuine walnut. The frame is equipped to either be hung or it has a built in stand for display on a shelf or table. The actual plaque is made from plastic. It is very difficult to show the picture because it is in very pastel shades. 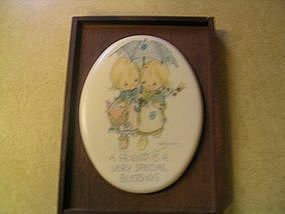 At the bottom it says "A Friend is a Very Special Blessing." There are very little signs of wear. If you have any questions regarding this item, please email. I need your zip code to calculate the postage.